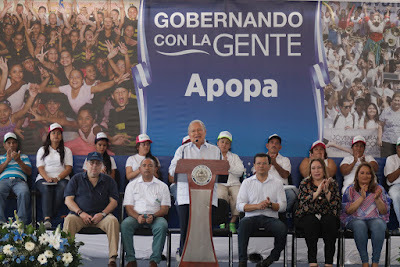 Gobernando con la Gente (Governing with the People), is the president's time to deliver a broadcast speech about all recent accomplishments of his administration. He brings along other executive branch officials who also speak about how the government is fulfilling its promises to the country. There's also usually a delivery of notebook computers to some local schools, land titles to residents of some local community, and announcement of some building project in the community. This weekend, the executive branch roadshow came to the city of Apopa. Apopa is located just northeast of San Salvador and has long struggled with crime and violence. (Its mayor was arrested in 2016 for putting the municipal government at the service of the Barrio 18 gang). Sánchez Cerén spoke of recent security measures in the country, delivered some computers, and signed a program to support small businesses. The president and his foreign minister spoke of their entreaties to the US government to extend the DACA and TPS immigration provisions for the benefit of Salvadorans. Joining the president on the stage was Steve Montenegro, a Salvadoran American who is a Republican state senator from Arizona. It's not clear that the president's staff had done much checking on Montengro's voting record, because he was the one Latino legislator in Arizona to vote for the state's draconian "round up the immigrants law", SB 1070. Montenegro has also been publicly defending Donald Trump's pardon of xenophobic sheriff Joe Arpaio. 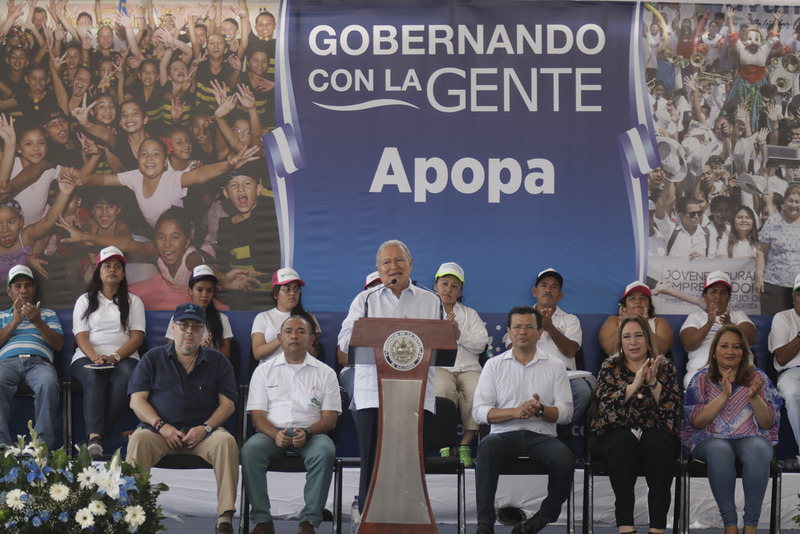 For his part, Montenegro told the citizens of Apopa that US had a great hope for the future of El Salvador and an admiration for its people. There's no word on whether Sánchez Cerén asked Montenegro how he feels about DACA -- Montenegro has been on CNN publicly opposing DACA, despite being a child immigrant from El Salvador himself.